Home » Instructors » Jan Dean, Ph.D.
Jan Dean, Ph.D. Fisheries Science Virginia Tech University 1982, has taught five-day electrofishing courses for the USFWS National Conservation Training Center in several states (MO, AR, LA, AL, FL, NM, AZ, MI, CO), some multiple times, and in New South Wales, Australia since 2008. He has also taught a three-day electrofishing class in CA for the Northwest Environmental Training Center. 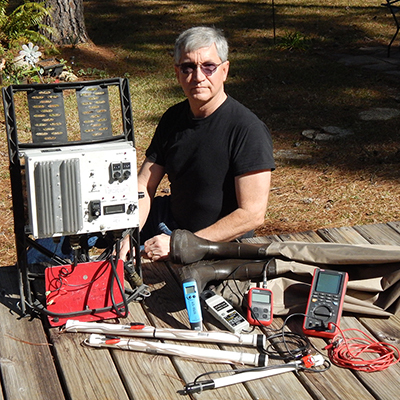 Jan has served as an instructor/consultant for an electrofishing workshop in CO and for two workshops for the Missouri Department of Conservation. He now serves on the graduate committee for an MS student at the University of Missouri for a project involving electrofishing for Smallmouth Bass, Blue Catfish and Flathead Catfish. Jan has served as an instructor for electrofishing workshops at AFS meetings in Savannah GA, Kansas City MO and Oklahoma City OK. Jan has written 20 electrofishing blogs for Electrofishing.net, authored an electrofishing article in a fisheries journal, has two more electrofishing articles in review, and has made presentations on electrofishing research at American Fisheries Society meetings.